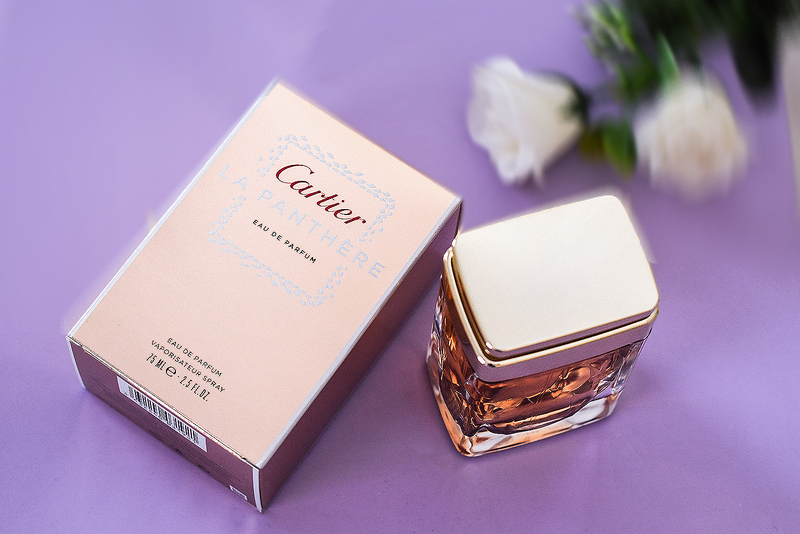 This La Panthere eau de perfume by Cartier, that launched in 2014, I received for Christmas but never got a chance to do a review on the blog, until now. 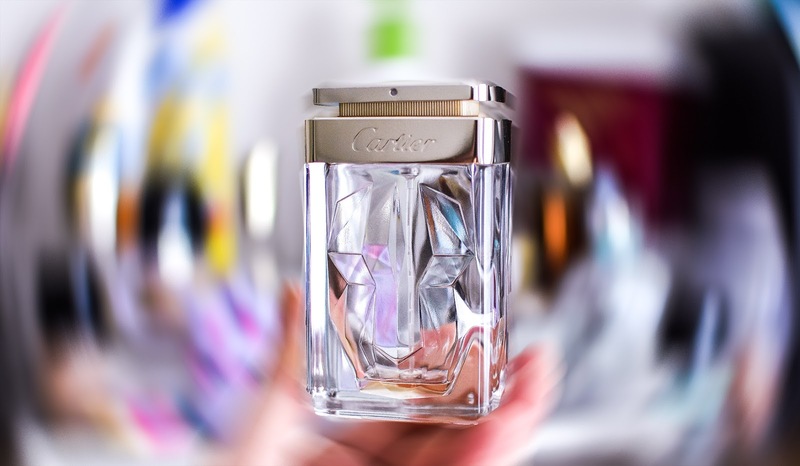 This is actually my first Cartier perfume and when I received as a Christmas present, I was very excited to check it out. When I first spray it on, I was not sure, it was the right scent for me but after some time, I started enjoying wearing it. It starts with floral notes for me, and then, dries down to woody notes mixed with powdery softness. La Panthere is a floral, little bit powder-y fragrance that can easily become your signature scent if you love floral scents. This perfume doesn't smell like an alcohol when you spray it, it doesn't give me headache (like some other fragrances do) and has amazing lasting power. And, can we talk about its' gorgeous bottle? As you can see, the golden bottle is simple but luxurious that has the face of the panther sculpted as a gemstone within a glass. This is not the perfume I would wear in hot summer days but it's definitely perfect during fall or Spring. I used to wear it almost every day this Spring. Would I buy it after I finish it? __ probably not, because even though it's a nice fragrance, it's not overly impressive to keep buying it. Have you worn La Panthere yet? Let me know, how you liked it. What a lovely bottle! I need to smell this fragrance. Thanks for your review Nina. I love perfume not only because it helps me smell greater, but the bottles make such amazing decor for your vanity! Lol. I've never tried La Panthere but I enjoyed reading your review about it. Also, your first pic looks amazing! I haven't tried that perfume yet, the packaging looks gorgeous though. Got to try it on my next shopping spree. I've never tried this perfume before, but bergamot is one of my favorite scents so I might have to. I always love when a perfume has a beautiful bottle because it makes displaying it in your room that much better! Great review on the perfume! Me too, I love beautiful bottles for displaying. The packaging is gorgeous, and perfume seems very interesting! Thanks for sharing! I like powdery scents and I like that it does not smell like alchohol. And the packaging is gorgeous! Thanks for sharing your thoughts on this one because I got one of their colognes for the hubby and love it! I'll have to check this one out. I love the packaging as well, so pretty!I hope you're having a great summer so far! Such pretty packaging and sounds lovely! The packaging is super luxurious. I can tell that it smells even better than it look. I've never tried this perfume before but all the top notes sound like something I'd love! The packaging is so chic and pretty as well! Ohhh the perfume package is gorgeous! I could see myself going for a perfume like this! Wonderful review! That is such a pretty bottle, and gorgeous photos! I don't blame you, me too, I love pretty packaging. Hi Nina, it is always a challenge for me to find perfume that is not overpowering. Thanks for the review! Welcome back and have a beautiful week! Great review lovely! It is a beautiful bottle and I know exactly what you mean about perfume headaches! I would love to try it. I have heard great things about cartier and been wanting to try it soon. I'm not a big perfume person but that bottle is gorgeous. Thanks for visiting my blog. I have never tried Cartier's fragrances but this sounds quite lovely! Oh wow - this looks beautiful!